We recently published a post looking at the current state of lead generation for the payments sectorand highlighted a particular area which we believed payments firms should look to improve: the fact that they often provide lots of information to website visitors but that it’s difficult for visitors to wade through and find the right answers for their specific question. Without answering visitor questions, you can’t generate leads. However, there are plenty of other tactics which those in the payments sector could begin implementing should they wish to start generating more leads for their business and ultimately, more customers. This post gives you 5 tips for lead generation for the payments sector and is a fantastic starting point for any fintech firm looking to engage more visitors and make more conversions. 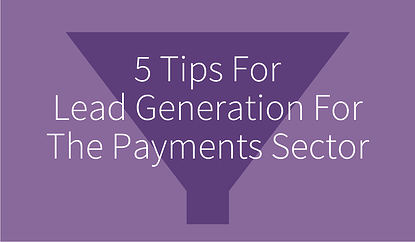 Our first tip is linked to our previous post on lead generation and information shortage in the payments industry. What is clear from browsing many payment processor websites, is that language surrounding product and service information, pricing and terms and conditions are all geared towards experienced consumers and eCommerce/retail professionals. Although it is likely that a large majority of customers approach your website with prior knowledge regarding payment technologies, the payments sector needs to be wary of the steep adoption curve of new technologies by novice business owners and consumers. If you wish to turn a website visitor into a lead, they need to be able to easily understand what it is that you offer and the rules and limitations which come with your services. If a browsing visitor can’t easily comprehend your pricing structure and the technologies which you offer then they will simply leave for a competitor. Make sure information on your website is easy to understand, even for less experienced prospects, and keep highly detailed information available further into the browsing process for your experienced audience. The modern world is fast paced and browsing visitors are looking for answers to their questions fast. Not only should you be making the information that you provide easy to understand but the most crucial information (in terms of what the prospect needs to know before they buy) shouldn’t take long to locate. Users will look at a range of payment processors when doing their research and they don’t intend to spend long with any of them, finding the information that they need to make a quick comparison. Users often leave web pages in 10-20 seconds, but pages with a clear value proposition can hold people’s attention for much longer. Information such as cost, setup time and customer support options are the kind of things which prospects want to make a quick comparison on. For example, if you are too expensive for a retailer then they might as well discover this early, rather than making the information hard to find and wasting both yours and their time. Keep the crucial information clear and just a few clicks away; answer the basic questions before enticing them to learn more and become hot leads. We analysed the number of clicks and the amount of time taken to find important information on some of the well known payments sites and found some rather interesting results. Find out more here. For lead generation for the payments sector to work, payments firms need to establish themselves as experts in their field, not just product or software providers. To generate leads you need to stand out as an organisation providing excellent service and knowledge to your customers. How do you do this? Provide advice and support on the bigger issues through social media, blogging and support documents available to your prospects, leads and customers. Why do this? It’s an important part of showing that your company and your product can help in a wide range of situations and can even encourage a dialogue between you and potential leads. It is an integral part of the inbound marketing process; the HubSpot blog has some excellent tips on how to become a thought leader and stand out in your industry. A gated piece of information can actually entice a prospect to become a lead too. Perhaps a guide on “Building Trust With Ecommerce Customers” (because payment processors are an important part of the eCommerce trust equation) could require details about a browsing visitor’s business before they are able to download it. After downloading they can then be encouraged to buy through further communication and publications. Providing the right information in the right way and being a thought leader in your field is a great way to set-up your website and to attract retailers to it, but what are you doing once they are there? Many organisations in the payments sector seem to operate the policy of allowing potential leads to navigate their websites on their own and expect visitors to make the decision to buy, alone. Some firms do offer telephone support, should visitors have further questions, but this is often with a sales representative – a phone call viewed as daunting for most. Payments firms should be engaging their potential leads on social media and across their website in order to develop a conversation and a relationship and ultimately turn them into leads and customers. Engaging with potential prospects on social media allows them to get to know the business in a comfortable manner and get their questions answered on the channel of their choice. Live chat can be used to proactively engage visitors which are clearly lost on site or look like they are in need of a little enticement to become a lead. Using live chat also allows website visitors to reach out in a relaxed and informal manner right from your website. The tip here is that you should be engaging with your potential leads across multiple channels in order to get to know each other better, establish a relationship and entice them towards becoming a lead. Another one of our recent blog posts examined why differentiation is important for payment processors. The key takeaway from that post was that payment firms (old and new) have to make sure that they were providing more than just a low cost service; to compete amongst today’s growing number of fintech firms, payment processors need to stand out from the crowd. Once you have established your differential, you need to draw your prospects’ attention to it. To generate more leads, make your unique selling point stand out on your website and use it to entice browsing visitors to discover more about your business. A relevant differentiation from the competition will set your business apart; make it known on your website, through social media and other promotions. These 5 tips for lead generation for the payments sector are just a starting point for your brand to start thinking more critically about how prospects behave on your site and how you are going to entice them to choose you. If you are serious about generating more leads for your business feel free to have a chat with us using the live chat tab below, and find out more about our lead generation services.